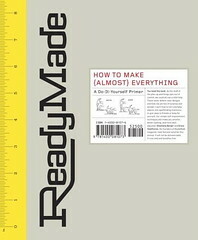 As a happy subscriber to ReadyMade magazine, I was thrilled to hear about the release of their first book. Unfortunately, my brief assessment is that there’s a huge opportunity for the book this could have been, but ReadyMade has largely missed it where it counts. From the pages of ReadyMade magazine appears this compendium of more than 30 projects making the most of recycled paper, plastic, wood, metal, glass, and fabric. Okay, I’m hooked. How soon can you get the book to me? But perhaps I should actually check out a copy in the bookstore before buying it. You know, just in case. So, here it is in the flesh. What a beautifully and creatively designed book! I love when design meets content, and the look and feel of this book perfectly match the edginess of the scope of projects. 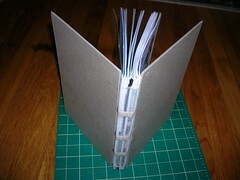 Basically, it looks like a handbound book, but the production goes straight from my step 8 to step 10, without ever covering the binder’s board with paper. The yellow cloth used to cover the spine board is marked as a ruler, which is pretty cool (even if this flourish would end up being the potentially most useful feature of the book). This makes for a cover that really speaks to paper crafters on a gut level. Truly an inspired idea, executed perfectly. The design combined with the pitch almost got me to buy the book without even opening it. But I was standing in the bookstore anyway, and I couldn’t help peeking. I was glad I did, because it saved me my money. A chopstick clock? A colander light sconce? Waterbottle loungechair? A CD rack made out of FedEx boxes? A coat rack made out of plastic detergent containers? The list of “playful” and “interesting” project ideas goes on and on. Though the book might have a lot in the way of “inspiration” for crafters, there’s not a single project in the book I’d personally want to make (or have be seen in my house). I expected this book to show me how to make projects comparable to those found in the “ReadyMade” magazine: Practical, attractive projects that make good use out of cast off items. Instead, this book shows projects made out of junk that look like nothing more than projects made out of junk. A coat rack made out of laundry soap bottles looks like a stack of laundry soap bottles. The cd racks made out of shipping cartons look like shipping cartons. I was very surprised to find not one item in the book that I wanted to make.Tastes being what they are, you may enjoy this book more than me. All I’m saying is that you’d probably want to look at a copy of it before buying, to make sure. I bought the book a few days ago, with hope in my eyes, and I’m re-selling it on craigslist today. So sorry, ReadyMade. You used to be the coolest thing, but you lost your way. A lot of people have felt passionate enough about the promise of this book to leave rather emotional critiques like this on Amazon. People want the book that this book could have been, but ReadyMade fulfilled their promise only halfway, with, frankly, the less important half. They nailed the design and concept, but slipped on the execution of the content. I can’t say I’m too surprised, though. I feel kind of conflicted about ReadyMade magazine itself. Though it usually contains more practical projects I’d actually want to do (in that sense, the book actually is kind of surprising) than Make magazine does (as much as I love that magazine, I’m not as into learning to solder or hack on circuit boards as I am with craft projects), when Make handles a project I would want to do, they do it so much better than ReadyMade does (and I’m not just saying this because I’ve written an article for them myself, though I feel I should disclose that, as well as the fact that I work for their parent company). That’s why I was so excited to hear the announcement about Craft magazine, and why I think so many other people are too. The promise of a whole magazine featuring craft projects done right (which is to say, done by the makers of Make) is quite exciting. I think projects can be hip without being impractical, cool without being ugly, and clever without being crappy. I think the potential of a Make/Craft book is even bigger than the one faced by ReadyMade before they tried and failed. When and if the good folks at Make put out a competitive book, it’s really going to be something special. And I personally can’t wait to see it. I was also disappointed when I browsed this book. I was also not too surprised. I subscribed to the magazine for a year then let my sub lapse because so many of the projects were focused on being clever, aesthetics be damned. Often the results were, in my opinion, more suitable to a college dorm room than an adult’s home. As an aside, it’s also the only magazine subscription I’ve ever had where they didn’t ask me to renew, neither before nor after expiration, so perhaps they could tell we weren’t meant for each other. Or, they’re just crappy businesspeople. ← Don’t Care for a Book? Alter It!